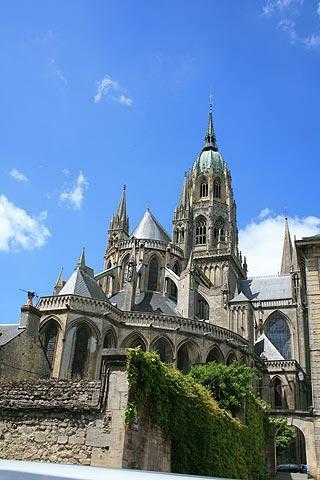 The town of Bayeux is a popular destination in Normandy, near the coast and north-west of Caen and is also listed as one of less than 100 important protected Historic Towns in France. 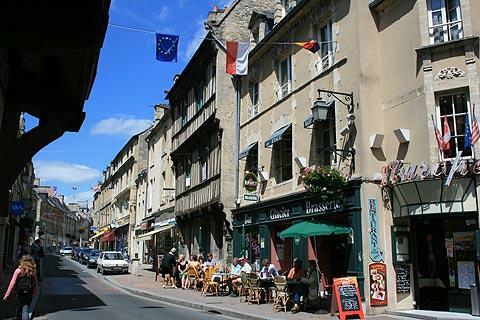 There are several reasons that people visit Bayeux including the famous tapestry; the town and cathedral; and the proximity of the Normandy Landing beaches. 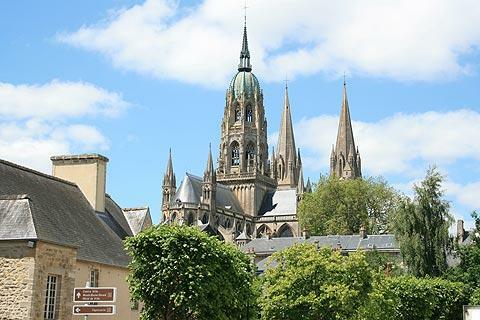 France This Way comment: of course, Bayeux is best known for the tapestry, but even if you don't plan to see the tapestry the rest of the town, especially the old town around the cathedral and along the river is well worth exploring. 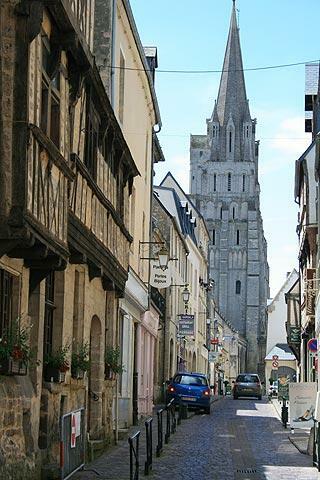 The Bayeux tapestry is without doubt the most famous tapestry in the world, and an unmissable site when you are in this part of Normandy. The tapestry relates the story of the conquest of England and King Harold by the Norman, William the Conqueror, in the Battle of Hastings, including the preparations for the battle and the battle itself. Although the origins of the tapestry are slightly unclear, it appears probable it was either commissioned by the half-brother of William the Conqueror or his wife. The tapestry was also probably completed around 1077, and it seems likely it was made in England, although even that is not certain. Despite its probable English origins the tapestry is, of course, a French National Treasure. An extraordinary feat, the tapestry is about 80 metres long and 50 centimetres high and is a fascinating document that provides a great deal of valuable information about life at that time. 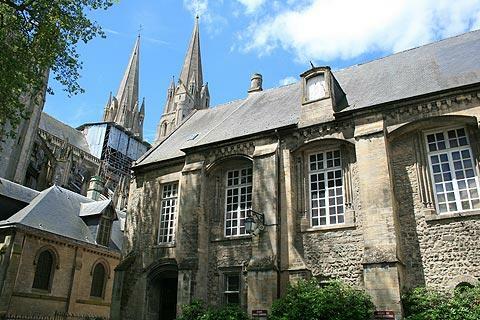 The tapestry can be seen, not surprisingly, in the town of Bayeux in the Centre Guillaume le Conquerant, itself a 17th century seminary building. 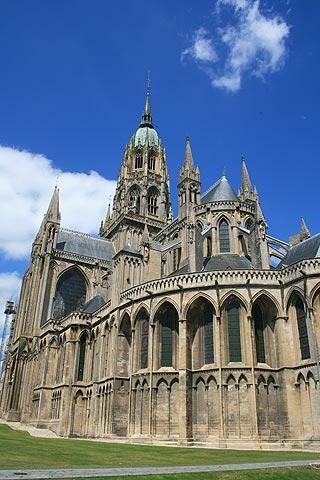 Bayeux itself is an attractive town with a reasonably well-preserved medieval centre, centred around a renowned cathedral. The Cathedrale Notre Dame dates in part from 1077, although most of what we see today is in gothic style and was built in the 13th to 15th centuries. 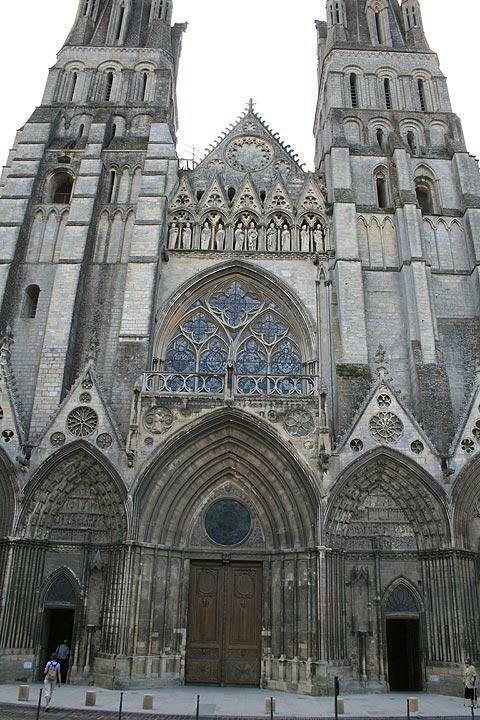 The tapestry was originally displayed here in the cathedral before being moved to its current location in the Centre Guillaume le Conquerant. Note that the stained glass windows in the cathedral, like the tapestry, tell the story of William the Conqueror. The medieval streets around the cathedral also have lots of medieval houses, some half-timbered, and many other historic houses of interest. These grand townhouses were built over a long period, from the 14th century to the 18th century, so include a wide range of different styles. 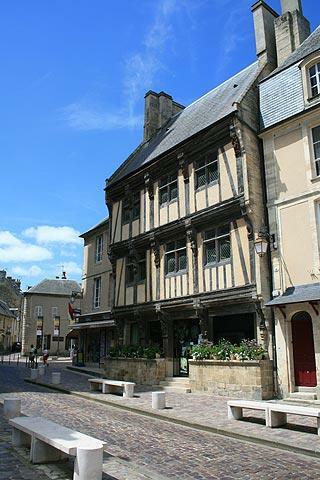 The Grand hôtel d'Argouges at 4 Rue Saint-Malo is among the most interesting: built in the 15th century it incorporates numerous carved statues in the upper parts of the facade. 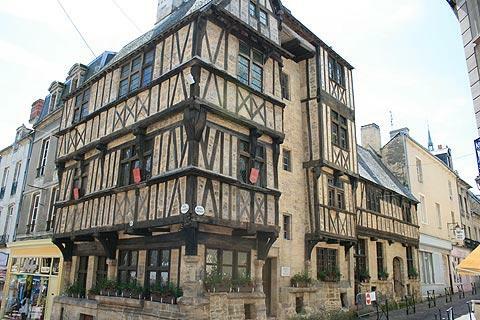 The house on the corner of 1, rue des Cuisiniers, is another very impressive half-timbered medieval house. 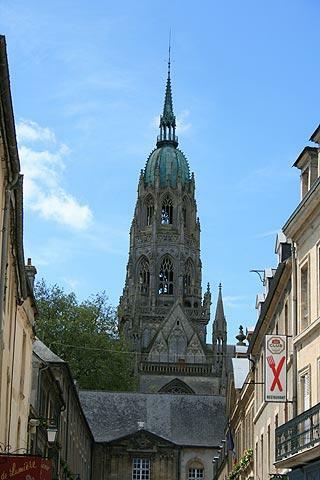 The Bayeux Tourist office can give you a useful leaflet with a suggested route to follow as you explore the centre, giving information about the individual sites you pass along the way. 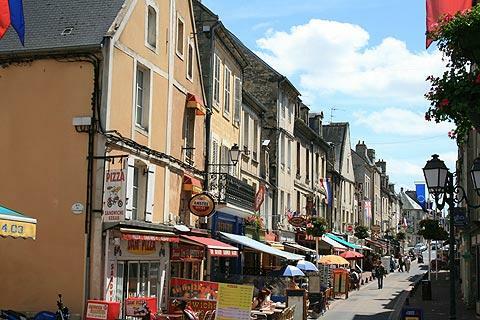 If the office is closed or you don't have time to complete the route then as a minimum you should explore the streets around the tourist office itself (Rue Saint Jean), the town around the cathedral and then stroll along the Rue de la Maitrise to the Place Charles de Gaulle. 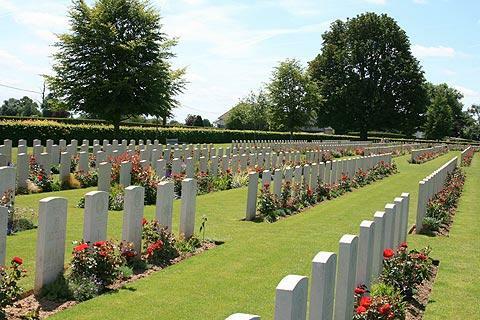 Nearby, Bayeux also houses the largest British war cemetery in Normandy. The cemetery is very moving, immaculately kept and the graves are planted with a lovely mix of perennials and red roses. Families of British soldiers buried here were offered the chance to write a message to be engraved on the headstone and reading the messages is a very poignant experience. Across the road from here is the Memorial Museum of the Battle of Normandy (Musée Mémorial de la Bataille de Normandie). This museum recounts the action seen in Normandy from the 7 June to the 29 August 1944. 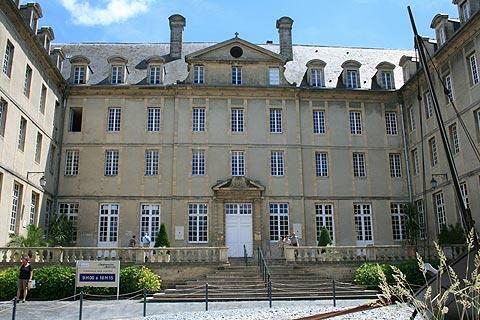 The Museum Baron Gérard in Bayeux is also interesting, with collections that tell the history of the town, including the important lace and porcelain industries, as well as exhibiting a good number of works of art. Bayeaux is a popular base for exploring the beaches where the allied forces landed in 1944 at the beginning of the reconquest of Europe. See separate article about a visit to the Normandy Landing Beaches.